The Police and Crime Commissioner has a duty to engage with the public to discuss the service they receive from the police. Alison Hernandez and members of her team attend many events which the public can attend to talk about their experiences and those of their communities. If you want to find out when the team is next in your area please visit the OPCC calendar. The police and crime commissioner also attends the quarterly Police and Crime Panel, which are open to the public and press to observe. The Police and Crime Panel supports and challenges the PCC in carrying out their functions. The panel has the power to request reports and call the PCC to attend its meetings. The Police and Crime Commissioner issues progress reports on delivering towards the objectives within the Police and Crime Plan and of the performance of the OPCC. The PCC reports to the Police and Crime Panel regularly. This information is available from the Panel’s website here (external site). 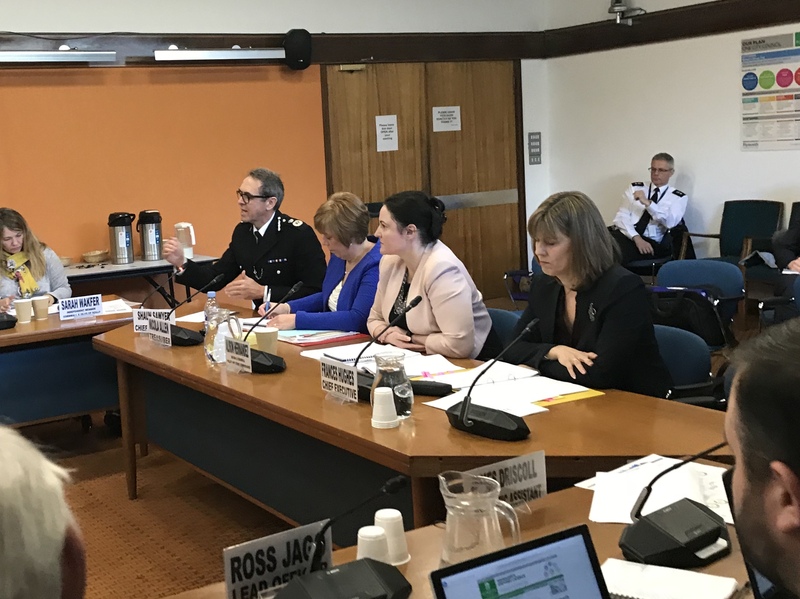 The primary role of the Committee is to provide the PCC and the Chief Constable with reassurance in respect of their internal control measures and environment. More detail on the operation and role of the Committee is provided in the linked Terms of Reference document here. The Joint Audit Committee (JAC) Devon and Cornwall and Joint Independent Audit Committee (JIAC) Dorset were formed in October 2012 prior to the election for the Police and Crime Commissioners (PCCs) in November 2012. The establishment of the Committees was in accordance with the requirements of the Financial Management Code of Practice (FMCP) for the Police Service for England and Wales as published in January 2012. Arrangements were made for the Committees to meet on a quarterly basis to receive and consider appropriate reports to effectively discharge its responsibilities as defined within the Terms of Reference, thus providing public confidence in the governance of policing in Devon and Cornwall and Dorset. The two Chief Constables and the two PCCs agreed with the recommendation to constitute a new single audit committee to service the four legal entities through the realignment, and renaming of the Strategic Alliance Audit Committee (SAAC), Joint Audit Committee (JAC) and Joint Independent Audit Committee (JIAC). Therefore, the existing Joint Audit Committee (JAC) for Devon and Cornwall and the Joint Independent Audit Committee (JIAC) for Dorset have been formed into a single Independent Audit Committee (IAC), working across both forces and OPCCs. The single Independent Audit Committee meets at regular intervals during the year in order to review, scrutinise, challenge and provide reassurance over internal control and governance arrangements across both Devon and Cornwall Police and Dorset Police. They report equally to both Chief Constables and Police and Crime Commissioners.